Welcome to join us in this introductory webinar for the ONL172 course on Tuesday 26 September 10:00-11:00 (CEST)! 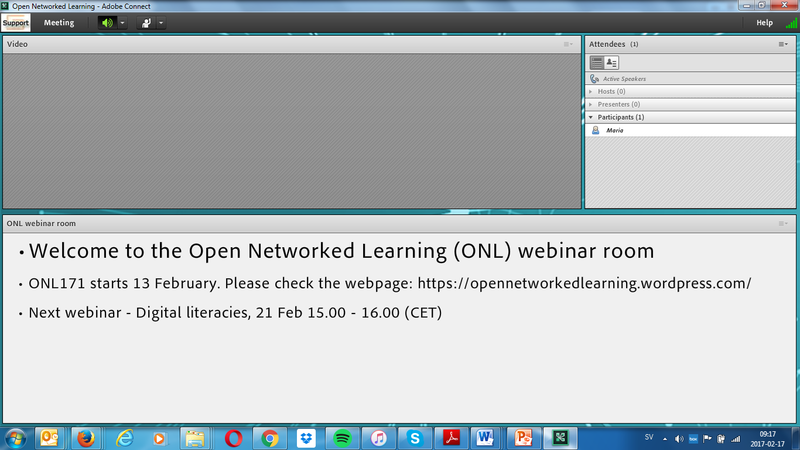 This first webinar will be an opportunity for all participants and the ONL172 course team to get together online in our ONL webinar room. The webinar will give you an overview of the course and an introduction to get started. You also will be able to share expectations and to bring up any course related questions that you have for discussion. Please find the recording here. , and the presentation here. No audio in Adobe Connect? The best option is to use a cable for the internet, Wifi might work but not optimal. Log in as guest and write your name in the field (or use your id if you have an account within sunet). This second option is how it should be to work optimally! If Adobe is running as a tab in your web browser then you will have sound problems. In that case go to the HELP menu at the top right and you will see an option to install the Adobe Connect add-in – do that! Please read more about Adobe Connect Downloads and Updates here.